Based on your esthetical and functional necessities, our team will design and build your space. Our landscape experts will do the design of the garden or terrace, taking on consideration your personal taste and the location. 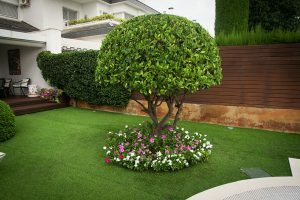 They will advise you in several important matters such as ornamental looks, watering systems, lighting, garden furniture, pavement and colouring. At the same time, our specialists will offer technical advice on the plant and tree election so as to be the most adequate for their land, location and environment. Once the design is approved, we will start the implementation of the project and the garden/terrace construction. Always taking care of every detail. We collaborate with companies which work exclusively in the construction of high quality swimming pools with the best finishes: stone, wood, different size and colour tiling, lighting and accessories like fountains and waterfalls. 10 years guarantee.